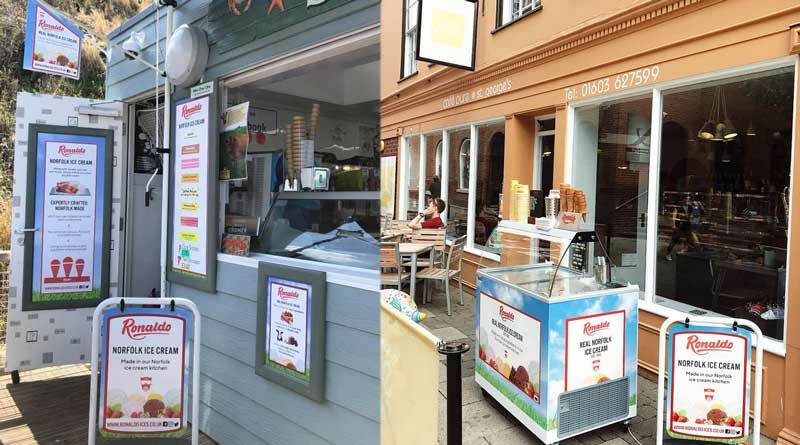 Over our 35 years of making & selling delicious Norfolk ice creams, we have learned the value of effective point of sale. The Ice Cream industry is a competitive one so it is our mission to help you to succeed with us. In line with our revamped logo and new packaging launching 2019, our point of sale offering was revamped earlier this year, and we’re delighted with the results. Modelled beautifully by the fabulous Reef Stop in Cromer and Cafe Pure in Norwich, the new point of sale is fresh, vibrant and champions our use of local, natural ingredients and our Real Norfolk credentials. If you are a new customer looking to kit out your shop, cafe or kiosk or an existing customer looking to update your store, don’t hesitate to get in touch.